Kathmandu- 22 June, 2015: The Earthquake Relief Centralised Kitchen Project, a joint initiative undertaken by The Akshaya Patra Foundation, Jamsetji Tata Trust and Sipradian Sahayata Sanstha began operations by serving the first meals in the evening of June 19, 2015. The kitchen provided a fresh meal of rice, dal (lentils) and potato sabji (vegetable dish) to 1,100 people in Bode, one of the eleven areas to be served wholesome meals under the relief project. Bode is one of the locations where people from the worst affected area of Sindhupal Chowk have been accommodated in makeshift shelters. On June 20, 2015, the morning meal was served to 5,500 people. Approximately two tons of rice, 220kgs of dal, 70kgs of tomato, 140kgs of potato and 30kgs of spices along with other condiments were used to make the meals. The kitchen, which cooks an estimated 10,000 meals in a batch and serves about 100,000 meals a day, will remain operational for the next six months. Following this, the initiative will continue to provide relief to the beneficiaries till stability is achieved in the region. Speaking on the initiative Mr. Madan, Camp Coordinator at Bode and local resident says, "Despite all the things that have happened we will come up from this. The relief kitchen initiative has also given us the strength to look forward." The kitchen, allotted a 2,500sq.ft area, is housed in a Pre-Engineered Building (PEB) structure. Here, the 33-member team from Akshaya Patra has set up the facility in a record time of five days. The temporary centralised kitchen is equipped with three 600 litre capacity cauldrons to cook rice and one 1,200 litre capacity cauldron to cook dal. Besides the cauldrons, other machines to cut and grind vegetables are also being used to accelerate the process of preparation. Most importantly, throughout this project, sanitation and other necessary hygienic processes have been stringently followed to serve food safely and implement the programme effectively. The kitchen has been set up at Subakamana Party Palace, Suryabinayak Chowk, Bhaktapur, and serves meals to eleven locations in and around Bhaktapur, namely Bhelukhel, Maheswari, Jella, Garun Kund, Kamal Binayak, Thulo Bayasee, Bayasee, Bode, Thali, Gokarneswar and Bhugmati. The kitchen facility was conceptualised after a joint committee comprising of nominees from Tata Trust, The Akshaya Patra Foundation and Sipradian Sahayata Sanstha visited the earthquake affected region. There it was found that as many as 55,000 people in and around Kathmandu are homeless, with clean food and drinking water in short supply. Following this, a decision was made to set up the Earthquake Relief Centralised Kitchen Project in Bhaktapur sponsored by the Tata Trust, and facilitated by The Akshaya Patra Foundation and Sipradian Sahayata Sanstha. Madhu Pandit Dasa, Chairman, The Akshaya Patra Foundation, expressed his gratitude saying, "I wholeheartedly thank the Government of Nepal, Jamsetji Tata Trust and Sipradian Sahayata Sanstha for their unflinching support in helping us set up this earthquake relief kitchen facility in the affected area. With their continued involvement, we are confident that we can provide wholesome, nutritious food to those affected in the region and offer comfort during this time." 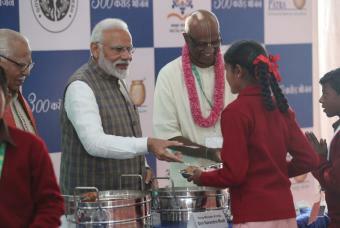 About The Akshaya Patra Foundation: The Akshaya Patra Foundation headquartered in Bengaluru, India, executes the world's largest (NGO run) mid-day meal programme. Implementing the Government of India's Mid-Day Meal Scheme with a vision that 'No child in India shall be deprived of education because of hunger', the Foundation today serves over 1.4 million children from 10,770 Government and Government aided schools across 10 states in India. Akshaya Patra is currently working towards fulfilling its mission of feeding 5 million children by 2025. Akshaya Patra has achieved the scalability and sustainability of its programme by leveraging technology to feed underserved children across India. With 10 kitchens ISO 22000:2005 certified, and the remaining in the process of certification, today Akshaya Patra's operations model has become the subject of various studies from across the world.